Cut the small business Corporate Income Tax (CIT) rate by 22 per cent — from 4.5 per cent to 3.5 per cent, effective January 1, 2018. The government is proposing to simplify Ontario’s Personal Income Tax (PIT) by eliminating Ontario’s surtax and replacing it with new rates and brackets. This would increase the transparency of Ontario’s PIT and ensure that surtax payers do not receive more tax relief from claiming non-refundable tax credits compared to other taxpayers. To maintain support for charitable giving, the government is proposing to enhance the Ontario Charitable Donations Tax Credit (OCDTC). Ontario is also proposing taxation measures to help businesses become more competitive. In the 2016 Budget, the government committed to make Ontario’s PIT simpler and more transparent. Ontario is proposing to take a significant step towards meeting this commitment. Ontario’s PIT includes a surtax, a legacy from the era when Ontario tax was calculated as a percentage of federal tax. However, the surtax functions as a tax on tax, rather than a tax rate applied directly to taxable income, reducing the transparency of Ontario’s PIT. For example, Ontario’s top statutory rate, shown on tax returns, is 13.16 per cent. As a result of the surtax, the marginal rate applied to taxable incomes over $220,000 is 20.53 per cent (that is, 13.16 per cent increased by 56 per cent). Further, the surtax prevents Ontario’s non-refundable tax credits from providing the same maximum tax relief to all eligible taxpayers. The surtax is calculated after Ontario non-refundable tax credits have reduced the amount to which the surtax applies. This increases the tax relief provided by these credits, such as the Basic Personal Amount (BPA), for higher income individuals by up to 56 per cent. To increase the fairness and transparency of Ontario’s PIT, the government is proposing to eliminate the surtax and make adjustments to the PIT brackets and rates, and enhance the OCDTC, effective for the 2018 tax year. As a result of the proposed changes, Ontario’s PIT would become more progressive. Ontario’s PIT revenue would increase by $275 million in 2018–19, while the top marginal PIT rate of 20.53 per cent is maintained. This increased revenue would help support key initiatives in this Budget. Ontario is one of only two remaining Canadian jurisdictions with a PIT surtax. Over 83 per cent of Ontario’s 11 million tax filers, or about 9.2 million individuals, would not see any increase in their PIT as a result of the proposed changes and many would pay less. Ontario currently has five statutory PIT rates plus two surtax rates calculated separately. The proposed changes would create seven statutory PIT rates applied directly to taxable income, and simplify the PIT calculation. Table 5.1 shows the current 2018 statutory PIT rate structure as compared to the proposed 2018 structure. 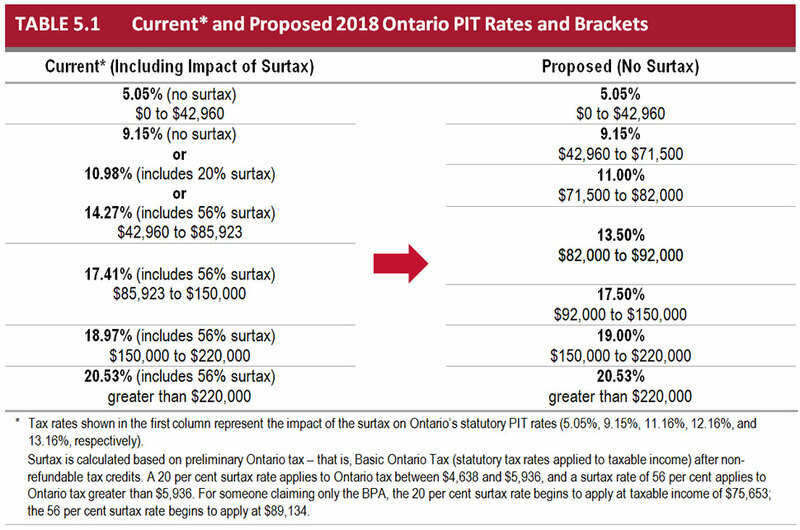 As shown in Table 5.2, under the proposed changes, an individual earning $95,000 would no longer pay surtax, simplifying Ontario’s PIT. Replacing the surtax with more progressive PIT rates and brackets means this individual would also pay $168 more PIT in 2018. Excluding Ontario Health Premium. Assumes that the taxpayer claims the Basic Personal, Canada Pension Plan, and Employment Insurance Amounts. Eliminating the surtax would ensure that higher income taxpayers do not receive more tax relief from claiming non-refundable tax credits compared to other taxpayers. Table 5.3 shows the tax relief received from the BPA by Ontario taxpayers. Currently, surtax payers receive additional tax relief. Excluding the Ontario Tax Reduction. To enhance support for charitable giving, the government is also proposing to increase the top rate of the non-refundable OCDTC, which provides relief to taxpayers who make eligible charitable donations. Currently, an OCDTC rate of 5.05 per cent applies to the first $200 in donations and a rate of 11.16 per cent for donations that exceed $200. The effect of the surtax calculation described above means the OCDTC rate can climb up to 17.41 per cent for surtax payers. Ontario is proposing to increase the OCDTC rate to 17.5 per cent for all taxpayers for eligible donations exceeding $200. The first $200 of donations would continue to be eligible for an OCDTC rate of 5.05 per cent. Table 5.4 shows the tax relief received from the OCDTC by Ontario taxpayers who make a $2,000 donation in 2018. Under the proposed changes, lower income donors would receive more tax relief from the OCDTC. Eliminating the interaction of the OCDTC with the surtax means that taxpayers receive the same relief from the OCDTC. The amount of tax relief provided by the OCDTC would increase by about $85 million in 2018. In 2018, 8.6 million tax filers would not be affected by the proposed changes. Approximately 1.8 million individuals would pay about $200 more PIT on average (or 0.5 per cent of their total federal–Ontario PIT), and about 680,000 individuals would see a reduction of about $130 of PIT on average. The government will introduce legislative amendments to implement the proposed changes. If passed, changes to PIT withholdings would start on July 1, 2018. Research and Development (R&D) is a critical driver of innovation and productivity growth. Increased R&D spending by Ontario businesses helps the development of new technologies and processes. However, business spending on R&D in Ontario has declined in recent years and continues to lag key competitors. Therefore, the government proposes to transform R&D tax support to encourage R&D activities by large and small businesses. To support large businesses in making long-term, significant investments in R&D, the government proposes to enhance the Ontario Research and Development Tax Credit (ORDTC). This additional support would encourage large companies to continuously invest in R&D, spurring innovation in the Ontario economy. The ORDTC is a 3.5 per cent non-refundable tax credit on eligible R&D expenditures. Effective for eligible R&D expenditures incurred on or after March 28, 2018, companies that qualify for the ORDTC would be eligible for an enhanced rate of 5.5 per cent on expenditures over $1 million in a taxation year. The $1 million threshold would be prorated for short taxation years. This enhanced tax credit rate would not be available to businesses where eligible R&D expenditures in the current taxation year are less than 90 per cent of eligible R&D expenditures in the prior taxation year. Eligible R&D expenditures in short taxation years would be increased to the full year equivalent. For the purposes of calculating eligible R&D expenditures in the prior taxation year, when a corporation is amalgamated with, or wound up into, another corporation, each predecessor corporation’s eligible R&D expenditures would be considered transferred to the successor. The Ontario Innovation Tax Credit (OITC) is an eight per cent refundable tax credit for small to medium-sized companies on eligible R&D expenditures. The government proposes to enhance the OITC to encourage smaller companies to make investments in R&D that will help them grow. 20 per cent and above, the company would be eligible for the OITC at a 12 per cent rate. The rate enhancement would be prorated for taxation years straddling March 28, 2018. The R&D conducted in Ontario supports the creation of intellectual property that contributes to long-term economic opportunities. A number of countries have implemented tax incentives, such as patent boxes (i.e., preferential CIT rates), refunds of taxes paid, tax deductions and exemptions to retain the economic and social benefits from intellectual property. When intellectual property resulting from R&D performed in Ontario is transferred to businesses in other countries, it provides economic benefits to those countries. That ownership could instead be retained in the province to help grow Ontario’s economy. Ontario is reviewing all of these initiatives for effectiveness and feasibility and will develop an incentive that works best for Ontario. The EHT exemption relieves more than 85 per cent of Ontario employers from having to pay the EHT. The exemption is available to employers who would not be eligible for small business relief under the federal Income Tax Act (ITA) through the Small Business Deduction (SBD). Ontario proposes to follow the eligibility criteria for the SBD for the EHT exemption. As a result, the exemption would only be available to individuals, charities, not-for-profit organizations, private trusts and partnerships, and Canadian-controlled private corporations. Ontario would incorporate federal anti-avoidance rules related to the multiplication of the SBD into the Employer Health Tax Act. In implementing these measures, Ontario would alsodetermine the EHT rate for associated employers in a way that is consistent with the application of the EHT exemption threshold for these employers. Legislation for these proposed changes, if passed, would become effective January 1, 2019. There will be an opportunity for public comment before the legislation for the anti-avoidance changes is introduced. Income sprinkling involves diverting income from a high-income individual to family members in whose hands the income would be taxed at lower combined federal–provincial PIT rates. Currently, income shifted to minor children is taxed at the highest combined federal–provincial PIT rate — also known as tax on split income. The federal government is proposing to address income sprinkling by extending the tax on split income rules to adult family members who are not active in the business, with certain exceptions, beginning with the 2018 taxation year. Ontario’s small business deduction reduces the Ontario general CIT rate for small Canadian-controlled private corporations (CCPCs) and associated corporations, on up to $500,000 of qualifying active business income. The $500,000 business limit is phased out on a straight-line basis for CCPCs (and associated corporations) that have between $10 million and $15 million of taxable capital employed in Canada. The 2018 federal budget proposed an additional phase out of the federal small business limit. Effective for taxation years beginning after 2018, the federal small business limit would also be phased out on a straight-line basis for CCPCs (and associated corporations) that earn between $50,000 and $150,000 of passive investment income in the taxation year. The business limit of a corporation would be the lower of the business limit determined on the basis of taxable capital and the business limit determined on the basis of passive investment income. Ontario proposes to parallel the federal measure on passive investment income. In its 2018 budget, the federal government introduced two measures to address the use of sophisticated financial instruments and structured share repurchase transactions by certain Canadian financial institutions to realize artificial tax losses. These measures include proposed amendments to the “synthetic equity arrangement” and “securities lending arrangement” rules, as well as a specific stop-loss rule applicable to share repurchase transactions. Ontario supports the federal measures that deny artificial tax losses realized on these types of structured transactions and help protect the common tax base, and will automatically parallel these changes once federal legislation is approved. As announced in the 2017 Budget, Ontario created a group of expert tax advisors dedicated to identifying and addressing tax loopholes and sophisticated tax planning schemes. The Province is working closely with the federal government, the Canada Revenue Agency and other provinces and territories to combat aggressive tax planning schemes that are eroding the common tax base. As outlined in Chapter IV, Section B: Working with Federal, Territorial, Provincial and Municipal Partners, Ontario intends to enter into an agreement with the federal government under which Ontario would receive 75 per cent of the federal excise duty collected on cannabis intended for sale in the province. Currently, many goods purchased off-reserve by a Status Indian, band or band council are eligible for a rebate of the eight per cent Provincial portion of the Harmonized Sales Tax (HST). Certain goods, such as tobacco and alcoholic beverages, are not eligible for this rebate, meaning they are subject to the full 13 per cent HST when purchased off-reserve. Consistent with the treatment of these goods, it is the Ontario government’s intention for the full HST to apply to off-reserve purchases of recreational cannabis once legalized. Ontario takes very seriously the public health objectives associated with the legalization of cannabis. This approach aligns with Ontario’s commitment to reduce harm by promoting the responsible use of recreational cannabis. A Status Indian registered to obtain medical cannabis from a licensed producer in accordance with federal law will continue to be eligible for a rebate of the eight per cent Provincial portion of the HST for purchases that are delivered off-reserve. Ontario plans to make a new regulation that would allow land transfer tax arising from certain unregistered dispositions of a beneficial interest in land through certain types of partnerships and trusts to be payable 30 days after the end of the calendar quarter in which the disposition occurred, rather than within 30 days of the disposition. This change is intended to help reduce the administrative burden on some businesses by creating reporting and payment schedules that better meet their needs. In addition, the Ministry of Finance plans to post guidance on its website regarding the minimum information and documents that an authorized representative of a partnership or trust should provide when submitting a consolidated quarterly filing. The Ministry of Finance continues to review issues raised in previous consultations. The Province proposes an amendment to the Taxation Act, 2007, to extend eligibility for the Ontario Interactive Digital Media Tax Credit to film and television websites purchased or licensed by a broadcaster and embedded in the broadcaster’s website. The amendment would apply to websites that host content related to film, television or Internet productions that have not received either a certificate of eligibility or letter of ineligibility before November 1, 2017. Table 5.5 reflects changes in government revenue, unless otherwise indicated. Measure represents an increase in government expenditures. The left side of the table displays the interaction of the surtax with the current statutory tax rates of 5.05 per cent for taxable incomes below $42,960, 9.15 per cent on taxable income between $42,960 and $85,923, 11.16 per cent on taxable incomes between $85,923 and $150,000, 12.16 per cent on taxable income between $150,000 and $220,000, and 13.16 per cent on taxable incomes above $220,000. The surtax is calculated as 20 per cent of Basic Ontario Tax after non-refundable tax credits, concerning the rates above, between $4,638 and $5,936 and 56 per cent on tax greater than $5,936. The 20 per cent surtax can increase the 9.15 per cent rate to 10.98 per cent starting at taxable income of $75,653 for someone only claiming the Basic Personal Amount. The 56 per cent surtax can increase the 9.15 per cent rate to 14.27 per cent starting at taxable income of $89,134 for someone only claiming the Basic Personal Amount. The 56 per cent rate can increase the other statutory tax rates as follows: 11.16 per cent increases to 17.41 per cent; 12.16 per cent increases to 18.97 per cent; and 13.16 per cent increases to 20.53 per cent. The right side of the table displays the changes to the personal income tax rates and brackets that the government proposes to implement for 2018 and beyond. These cells show the proposed statutory tax rates as they would apply to taxable income. They are as follows: 5.05 per cent for taxable income below $42,960, 9.15 per cent for taxable income between $42,960 and $71,500, 11 per cent for taxable income between $71,500 and $82,000, 13.5 per cent for taxable income between $82,000 and $92,000, 17.5 per cent for taxable income between $92,000 and $150,000, 19 per cent for taxable income between $150,000 and $220,000, and 20.53 per cent for taxable income greater than $220,000, which integrates the maximum impact of the Ontario surtax.